The Centre for Elderly Empowerment & Care (Ehsan) is a non-governmental organization established in the year 2003 by Her Highness Sheikha Moza bint Nasser, under the umbrella of Qatar Foundation for Social Work. The centre aims to promote the role of older persons, and their contribution to the social, economic, and cultural development in the State of Qatar. It also aims to empower the targeted group and support their active participation in all relevant areas, improve community awareness of their fundamental rights and issues, while working to achieve active communication between generations, and emphasize the role of the family in caring for older persons & reduce the practice of enrolling older persons in shelter homes. The centre also adopted the above-mentioned vision and values to provide necessary services to any person above the age of 60 years old. 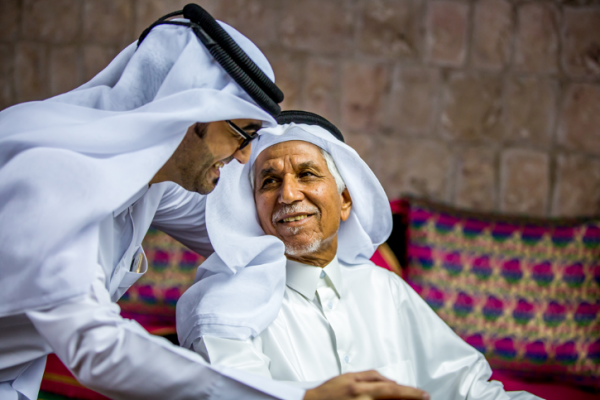 The centre provides a wide range of services for older persons & the Qatari community completely free, whether they are male or female, a Qatari citizen or a non-Qatari resident. These services include comprehensive care services through a fully functional state of the art shelter, accepting any older person in need of it. The centre also provides Home Care services that include guidance & counseling for older persons and their families to reinforce family bonds, physiotherapy, rehabilitation, nursing, nutrition guidance, & other social services that include providing necessary supplies to enhance proper care, such as wheelchairs, medical beds, & other health supplies. Part of Ehsan’s of wide range of services provided to older persons in Qatar is the home care service. A specialized visiting team comprised of highly qualified social workers, therapists, physical therapists, nutritionists, & nurses provide weekly or bi-weekly visitations to older persons residing in residential areas around Qatar. The visiting team provides medical, psychological, and social services to older persons, and provide guidance & education services to their family members and caregivers. This very popular and successful service among beneficiaries aims to reinforce family bonds, provide necessary services in the comfort of their home. In addition, to provide appropriate guidance to family members on how to care for their loved ones, and deal with changes associated with ageing. Among the reasons why this service is so popular, is because of its high level of confidentiality in its process, the enhancement of coping mechanisms for both older persons & caregivers alike, and the cooperative nature between the team, the beneficiary, and his/her family. Ehsan also provides physiotherapy services. These services are provided to both visitors of the state of the art physiotherapy facilities, or through the home care operation. In this operation, a team of highly personable and qualified specialists aims to alleviate injuries through accurate assessments and the subsequent development of appropriate treatment plans, protect older persons from illnesses and disabilities by promoting the maintenance of muscle fitness, and provide rehabilitation services. The centre also provides a very popular service for older persons in Qatar, Ehsan Club. Ehsan Club is a day care service designed to promote the principles of active ageing. There are 3 day care clubs located in different geographical areas around Qatar, soon to be expanded to 5 locations. These clubs intend to revitalize its members, ease burdens on families during the daytime, promote & build social cohesion, provide opportunities for older persons to cooperate, practice different hobbies, and increase productivity. Older persons benefit through participating in different activities around the club including taking part in different periodical series of lectures that are comprised of awareness lectures to highlight diverse issues associated with ageing, health & mental wellness lectures & lectures around social issues. The club also provides workshops to teach different skills, for example, painting, decoupage, sewing, healthy cooking, recycling, and many other forms of beneficial workshops. The club also organizes regular recreational, educational, & cultural trips around the country. Furthermore, the centre has a dedicated Social Awareness & Community Outreach department that aims to provide empowerment programs for older persons, raise community awareness about the rights, issues, and needs of older persons, promote intergenerational solidarity and provide necessary opportunities for interaction among them. It encourages and provides a platform for older persons to participate in program planning & design, to share part of the responsibility and help participants feel included and motivated. Types of empowerment programs provided by the center include technology training for older persons, designed to address the technological gaps among older persons. In addition, a series of awareness workshops targets private, public sector institutions, & youth centers to raise awareness about ageing. The centre also participates in multiple awareness exhibitions in national events. As well as takes part in various international campaigns, including a comprehensive 2-week campaign to celebrate the International Day of Older Persons in the month of October of every year. In addition, Ehsan participates in Elder Abuse Awareness Day by implementing a strong local campaign, due to it being a global social issue, which affects the health and human rights of millions of older persons around the world, and an issue which deserves the attention of both the national & international community. Ehsan also celebrates Alzheimer’s Awareness month with similar campaigns. In addition to these efforts, Ehsan participates locally through the issuance of multiple publications & researches around many aspects of the subject of ageing, healthy ageing & older people’s rights, and awareness publications about various diseases that affect older persons. Ehsan believes in the importance of the role of each member in the society plays to enhance the respectful treatment and adequate care for older persons. It also believes that a healthy society encompasses people of all ages, and attention must be drawn to the importance of caring for older persons and the proper ways to support them in their homes. Instilling these principles in the society is achieved through undertaking campaigns designed to spread the culture of solidarity between generations, through 2 important initiatives that are held yearly in collaboration with the Ministry of Education in the State of Qatar, one being the “Wing of Mercy” Initiative, and the other is the “Ehsan Scientific Research Contest” for school students. According to the United Nations, older persons are increasingly seen as important contributors to social development. Their abilities to act for the betterment of themselves and their societies should be woven into policies and programmes at all levels. In the coming decades, many countries are likely to face fiscal and political pressures in relation to public systems of health care, pensions, and social protections for a growing older population. That is why Ehsan is a strong supporter of many international efforts put in place to highlight the importance of older persons in social development and seeks to promote and advance health and well-being into old age and undertake suitable measures to enable environments that are supportive of older persons. Ehsan is a strong supporter of The Madrid International Plan of Action on Ageing (MIPAA). It agrees with the United Nation’s assessment that in many parts of the world the awareness of MIPAA remains limited or non-existent, which limits the scope of implementation efforts. More action must be taken in the efforts to increase recognition of strengthening the protection of human rights of older persons. The centre understands that older persons’s issues must be taken into account in MIPAA’s implementation in order to ensure that no one is left behind. Ehsan actively promotes mainstreaming ageing issues. It also is involved in policy support and strong advocacy for the implementation of national social development agendas, namely Qatar’s National Vision 2030. The centre’s efforts are commensurate with the international efforts directed towards the advancement of sustainable development goals related to ageing. In recognition of these global efforts directed towards the betterment of the lives of older persons & societies in general, Ehsan has recently added an office for international and regional relations to provide technical support for engaging in productive dialogue with like-minded civil society organizations in the field of ageing. Including non-governmental organizations for and of older persons & relevant United Nations agencies. In order to address this, Ehsan has become a member of multiple prominent international organizations & federations including The Global Ageing Network, The International Federation on Ageing, and The Global Alliance for the Rights of Older People. Moreover, Ehsan has attended multiple important international conferences including UN ECOSOC sessions, Open Ended Working Group on Ageing meetings, and other important international conferences in the field of ageing that provide a suitable platform to share national experiences in developing and implementing policies and programmes aimed at strengthening the promotion and protection of the human rights of older persons. This is the first step towards the suitable exchange of lessons learned, experiences gained, the development pathways for cooperation, and building strategic relationships and alliances with multiple possible cooperating partners in the future. Ehsan is dedicated to playing an active role in the global efforts directed towards the betterment of the lives of older persons.